Reason for inclusion: The Three Colors trilogy is widely considered to be among the best trilogies in history, and it has been a major blind spot for me. 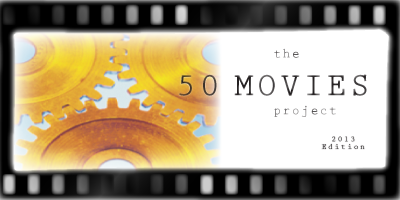 I had also never seen a Krzysztof Kieslowski film before this project. 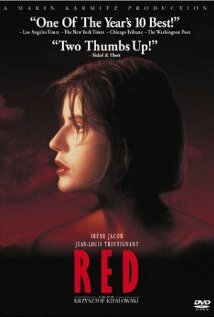 In closing out the Three Colors trilogy, Red follows the French ideal of fraternity. Here we have a number of individuals that are all connected in some way, often without them truly knowing it. 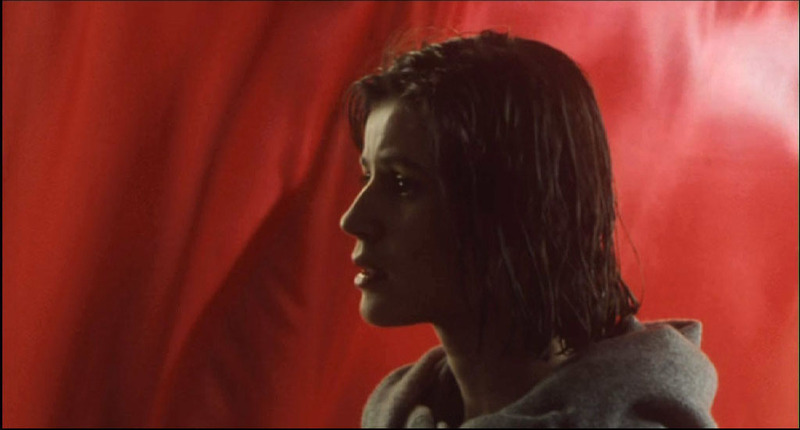 Valentine Dussaut (Irène Jacob) is a beautiful young woman who stays busy by modeling and taking ballet lessons. One night while driving home from dance practice, she accidentally hits a German Shepherd with her car. Valentine finds the owner’s address on the dog’s collar and drives in that direction (presumably the owner is closer than an animal hospital). 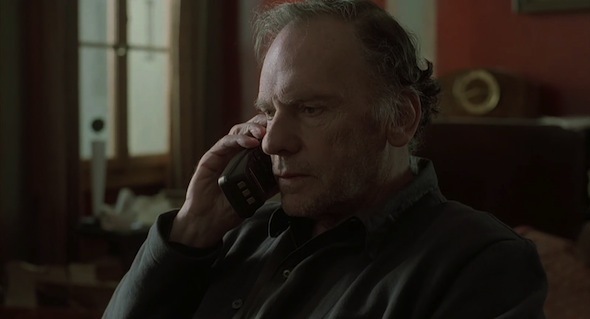 She notifies the owner, an old reclusive ex-judge named Joseph Kern (Jean-Louis Trintignant), though he seems completely ambivalent to the incident. He tells Valentine to keep the dog, which she does, and promptly takes it to the vet. Later, the dog, now fixed up thanks to the vet, runs away, ultimately going back to the judge’s house. Valentine rushes over there and discovers that Kern is eavesdropping on his neighbor’s telephone conversation. Apparently this is his post-retirement hobby, ad he has been doing this illegally for years. Valentine is appalled by his behavior, and she leaves with her dog, vowing never to return. Yet there is something that keeps bringing these two together, and they form a platonic friendship despite their obscenely different views on voyeurism. Another important relationship comes in the form of Valentine’s neighbor, Auguste (Jean-Pierre Lorit), and his girlfriend, Karin (Frederique Feder). They are seemingly in love, but little problems keep popping up between the two of them, as is wont in ill-destined relationships. Auguste’s life is startlingly similar to that of a young Kern, and he keeps ending up in a series of near-miss encounters with Valentine. Fate is continuously acknowledged via these coincidences. Perhaps Valentine and Kern would have made a great couple if they had been able to meet at the same age; after all, they seem to be kindred spirits. It is possible that it is now her destiny to be with Auguste, who is currently going through a series of events similar to those that eventually made Kern a recluse. The performances here are fantastic — the unlikely friendship between Valentine and Kern feels effortlessly authentic thanks to Jacob and Trintignant — and there is certainly a lot of depth to the film. Red asks the most questions out of the trilogy, and there are so many layers that it is impossible to unravel them in just one viewing. My gut reaction was an appreciation of the film, but I didn’t fall in love with it like I did Blue and, to a lesser extent, White. I suspect that this may change on later viewings, as now I know what to expect, and I can pick up on the subtle clues that Kieslowski drops throughout the film. I would love to revisit this sometime down the road, but as it stands now, this ranks third in the trilogy for me. The trilogy to me is endlessly rewatchable, I can go back to it every few years, and immerse myself in that world again. Glad you enjoyed them too! Oh yeah, I’m definitely interested in seeing more of his work. I’ve heard nothing but great things about the Double Life of Veronique, so that will likely be my next selection from him. Nice review. I hope to finally start watching the trilogy tomorrow. Thanks! Hope you enjoy the trilogy. Very nice review and a great film. Haven’t seen it in some time. Time for a rewatch I think!!! Thanks man. Really enjoyed the whole trilogy. During my whole 90s project back in May, Red was among my most rewarding rewatches. And months removed, certain visual cues still stick. I prefer Blue, but Red sits comfortably at number 2 in the trilogy for me. if you haven’t seen The Double Life of Veronique, I would highly recommend it as your next Kieslowski. I’m already looking forward to revisiting Red, though I think I’ll wait a little bit before doing so. The Double Life of Veronique is high on my list of films to see as well.